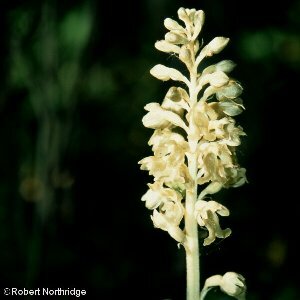 Bird's Nest Orchid (Neottia nidus-avis) gets both its English and Latin names from the form of the roots which resemble an untidy bird's nest. The roots are heavily infected with a fungus through which the plant obtains all its food from the soil or associated trees. 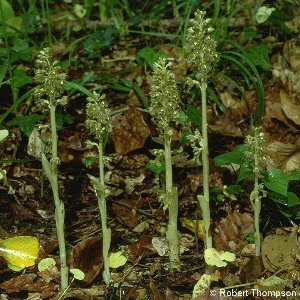 The above-ground parts are pale brown, including the flowers, and the plant has no proper leaves. The species is most often associated with beech trees, but also occurs in oak woods. The flowers open in June~July. Cross-pollination is carried out by insects, but self-pollination also takes place. 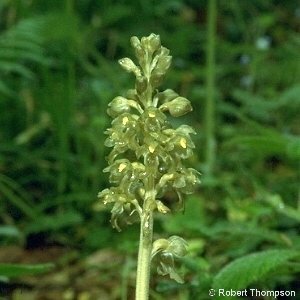 All names: Neottia nidus-avis (L.) Rich.